I LOVE camping: sleeping outside, eating outside, just being OUTSIDE for an e xtended period of time is incredibly relaxing for me. 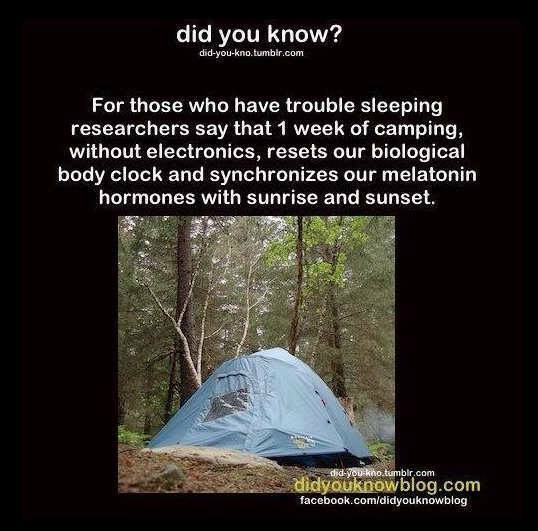 I always say that 24-hours of camping is like 1-week vacation anywhere else. The image below explains why I may be experiencing that! However, when we started camping with our young child there were definitely some new considerations to take into account, and here are my tips for a good camping trip WITH KIDS! Flat with enough clear area to set up your tent. Protects you from any elements you may encounter. Our favorite campground is in a canyon so it protects us from the wind, and we always make sure to pick a site without enough shade so that we aren’t baking in the sun. Close enough to the bathrooms (if it has them) for convenience, but far enough so it isn’t too loud. Secon dly, if you have a child that can’t sit up on his/her own than you will need one of these clip-on chairs that can fit on the end of any good picnic table. We found this really helpful whenever we did any kind of travel because it is like having a portable high chair. My final tip: I ALWAYS wear closed-toe shoes when camping EXCEPT INSIDE THE SHOWER. I literally wear my boots walking TO AND FROM the shower and only where flip flops inside the shower. WHY? Because I was bitten by a rattlesnake when I was 5-years-old and I was camping and wearing open-toed shoes. Between stubbing your toes on rocks, metal stakes left lying around and wildlife, I think it’s a really good idea to wear closed-toe shoes at all times while camping. And now on to the …. CLOTHES: 1-outfit for day, 1 for night if there is a big temperature change and 1 to sleep in. If I’m camping for less than 3-days that is all I take! A big hat if there isn’t adequate shade. We tend to camp places where it is really hot during the day and really cold at night so I’ll bring a sweater, a light jacket and a heavy coat! I ALWAYS wear closed-toe shoes when camping EXCEPT INSIDE THE SHOWER. I literally wear my boots walking TO AND FROM the shower and only where flip flops inside the shower. WHY? Because I was bitten by a rattlesnake when I was 5-years-old and I was camping and wearing open-toed shoes. Hope you enjoyed this post. Be sure to “FOLLOW” my blog with the links at the bottom of the page (mobile) or on the right-hand side (desktop).